This 4-bedroom villa for up to 8 guests is located in Pula and has a private swimming pool. Child friendly, beautiful villa Elda. 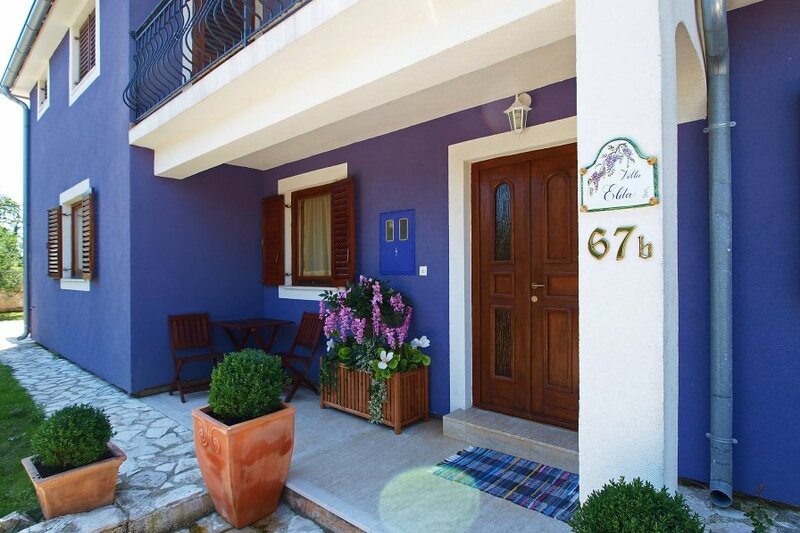 500 m from the centre of Rakalj, in a quiet, elevated position, 2 km from the sea, 2 km from the beach. Private: property 2'000 m2 (fenced), natural garden, swimming pool (10 x 5 m, depth 140 cm, 04.05.-28.09.). Pool house with shower and WC, barbecue, children's playground (swing). In the house: internet access, billiard table. Available: bicycles (2). Roofed, parking at the house on the premises. Shop, restaurant 500 m, shingle beach 2 km, rocky beach 2 km. Please note: baby equipment on request. The swimming pool is oval shaped. 5-room villa 150 m2 on 2 levels, west facing position. Beautiful furnishings: living/dining room 65 m2 with open-hearth fireplace, satellite TV, DVD and air conditioning. Exit to the terrace. 1 room with 1 double bed (160 cm, length 200 cm). 1 room with 1 french bed (2 x 90 cm, length 200 cm). Open kitchen (4 hot plates, oven, dishwasher, microwave, freezer). Shower/bidet/WC. Upper floor: 1 room with 2 beds (90 cm, length 200 cm). 1 room with 1 french bed (160 cm, length 200 cm). Exit to the balcony. Shower/WC. Air-conditioning. Balcony 9 m2, terrace 25 m2, roofed. Terrace furniture. View of the swimming pool. Facilities: washing machine, children's high chair, baby cot. Internet (WiFi, free).